This toy could provide some of the happiest memories for your little ones. A home made wooden toy car that they can put things in and push around and ride on will be a novel change from the plastic toys that they are used to. This toy car is perfect for day care, nursery, preschool, kindergarten, or any play center. This wooden toy car has enough weight to help exorcise and muscle development as the kids push it and ride it. You may make one of these toys as a Christmas gift. Before hand, ask the child their favorite color, then you can paint the wooden toy car the child's favorite color. On Xmas there are lots of little toys and goodies that they will want to put inside their new home made wooden car. 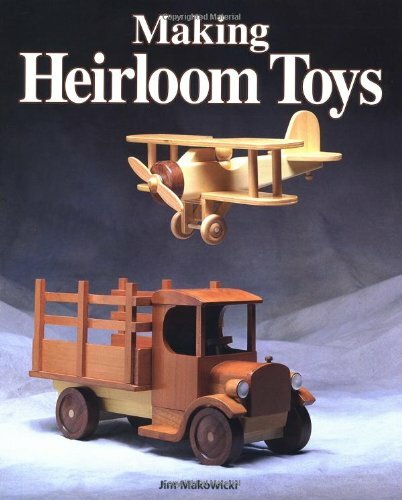 After you put your woodworking skills to use by making this toy for a birthday present, or Christmas gift it will bring an added dimension to the joy of watching them play. The finished toy car is 18" in length. Three compartments open for carrying toys. STEP 1. Have plenty of wood screws and glue on hand, and a few hinges. When making the toy, you must make sure that all parts are on securely, to prevent any possible choking hazard. Cut out the pieces. Use plywood for the bottom and floor, dowels for the long round parts, and normal wood for the rest. Sand all the wood parts of the toy car, so the surfaces are smooth and there are no sharp edges or splinters. STEP 2. Drill through middle of the wooden wheels so the dowels will fit tight. Paint the wooden headlights and wheels. If you want to, you can paint the blocks that will form the rest of the toy car as well. STEP 3. Glue and screw the spacers to the bottom plywood, using the dowels to align the spacers properly. Leave the dowels loose. There should be 1" of the ends of the bottom plywood still showing at each end. STEP 4. With the dowels off of the toy car, glue the painted wheels onto the dowels, but not too far on. Put the dowels with wheels in position on the bottom assembly, and drill some holes for screws from the below through the bottom plywood and spacers into the block (avoiding the dowels). Put screws through the assembly and into the block. Make sure that the wheels turn easily. If necessary, unscrew the block from the bottom, and screw them back together without the dowels & wheels. Then ream the holes with a drill to enlarge the dowel holes for a looser fit. And then unscrew it and reassemble it with the dowels & wheels in place. So now the wheels should turn freely. STEP 5. Attach the floor plywood centered on the block. Attach the bumpers (they will extend ½" past the ends of the bottom plywood). Attach the Back End on top of the back bumper. STEP 6. Attach the lower sides below the floor plywood on both sides. They should be centered between the front and back wheels on the sides of the toy car. STEP 7. Next make the trunk of the toy car. It will be like a mini toy box. STEP 8. Then make the cab, which will also hold toys. STEP 9. Assemble the front compartment. It is also attached solidly on the floor plywood. STEP 10. To make the wooden grill, alternate 1/8" pieces with ¼" mini-blocks. There are 4 of each. STEP 12. Use three hinges to put the hood, roof, and trunk lids on.